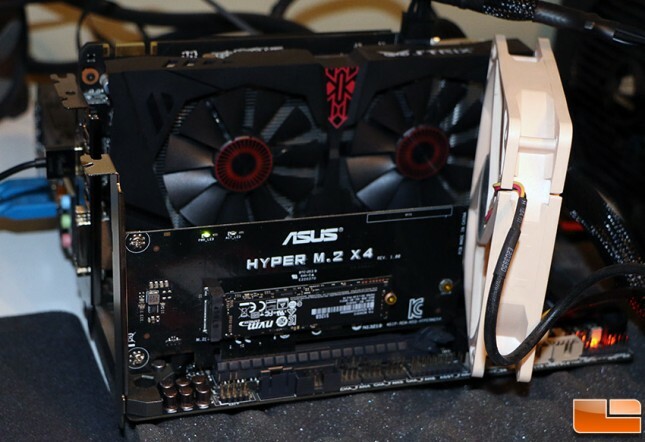 To try out the Samsung SSD 950 Pro 512GB M.2 PCIe SSD we used an ASUS X99 Sabertooth motherboard and used the ASUS Hyper M.2 x 4 add-in card. Samsung says that proper airflow is recommended for the Samsung SSD 950 Pro to keep the drive operating under it’s 70C threshold. 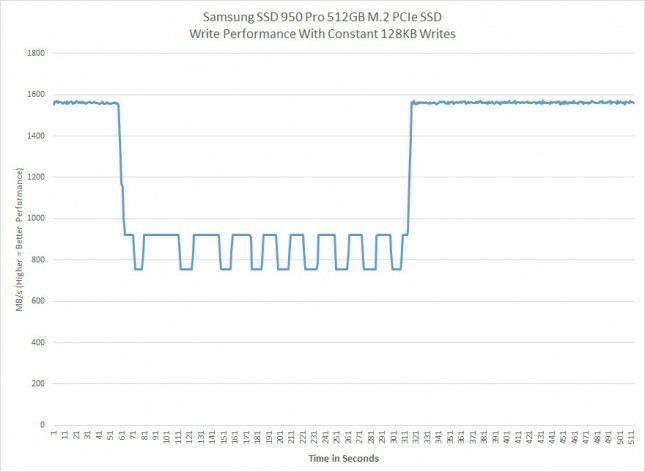 Samsung has implemented something called Dynamic Thermal Guard in the firmware for the SSD Pro 950 to keep the drives performance from dropping due to thermal throttling. Our solution was to place a 120mm cooling fan over the Samsung SM951 M.2 PCIe SSD to help keep it cool. The exact fan we used was the Noctua NF-S12B-FLX, which spins at 1200RPM for 59CFM of blowing power. With this setup we found no significant thermal throttling when we performed over 20 minutes of constant 128KB writes to the drive. The drive started out at around 1640 MB/s and settled down to around 1520 MB/s for the entire period of time. Samsung did not go into great depth about how Dynamic Thermal Guard actually works, but here is the information they gave to the media ahead of the SSD 950 Pro launch. 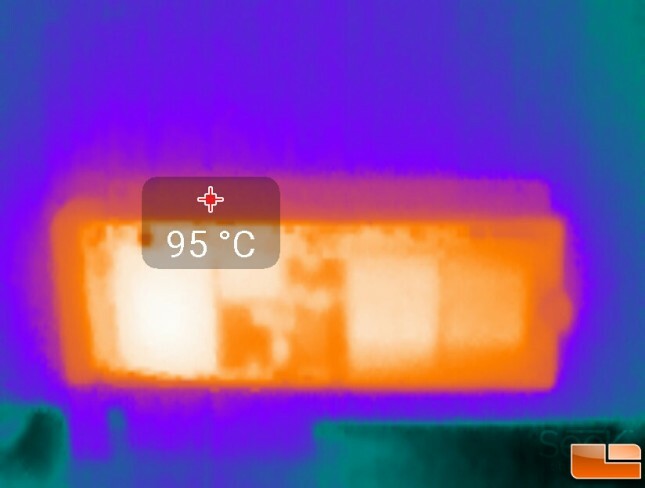 In most cases of data transfers, heavy workloads can induce heat and result in high temperatures. Once temperatures reach a threshold, memory performance may malfunction. As the leader in SSD memory solutions, we equipped the 950 PRO with Dynamic Thermal Throttling Protection technology to automatically monitor and maintain optimal operating temperature to reduce the risks of overheating. 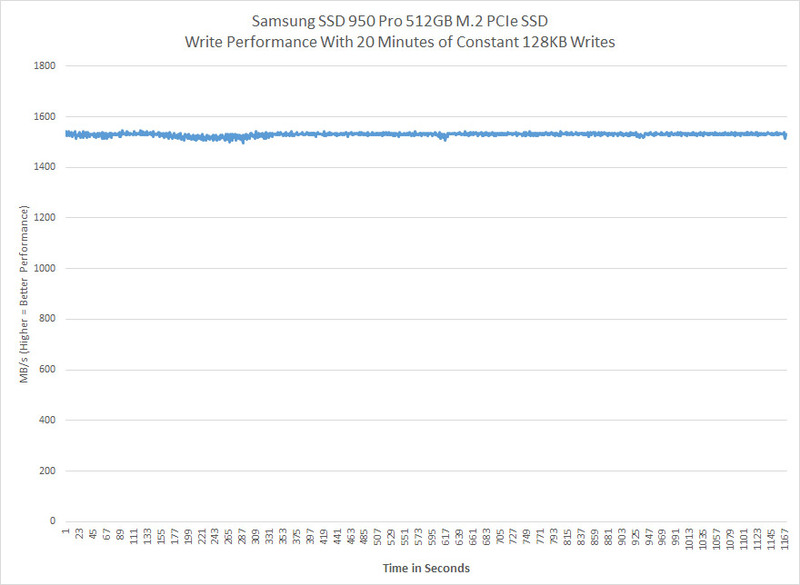 We do not anticipate any performance drops due to thermal throttling. When we let everything cool back down and re-did the test without the 120mm fan we noticed that the drive started to throttle at the 62 second mark. Our performance went from being ~1560 MB/s all they way down to 753 MB/s and then rising up to 879 MB/s during the throttle period. We plugged the fan back in at the 310 second mark and performance went right back up to ~1560 MB/s like nothing ever happened. Our SEEK Thermal Imaging Camera showed the hottest spot on the card was the controller when no fan was being used and it recorded the high temperature as 95C. If you buy a Samsung SSD 950 Pro you’ll want to make sure that it has some airflow as it does make a big difference in the performance of the drive when writing data to it for periods of longer than one minute.